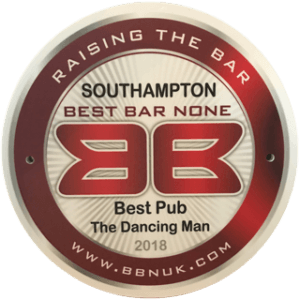 Last night 10 of the DMB team set off to a swanky do at The Grand Harbour Hotel in Southampton, for the 2018 Best Bar None Awards. We only went and won! We are officially Best Pub in Southampton for the 2nd year running. This award is a really big deal for us and makes all the hard work worth it. It’s special because it’s recognition for our policies from The Home Office, Police and Licensing – so pretty serious stuff. This is a testament to our amazing team, especially Christina Joy who has the unenviable task of making sure each criteria is met. We also received an accreditation and were Runner-Up Best Overall Venue!